What is a service offer? From day one, your vision becomes bigger with BuroHappold. We expand its parameters, pushing harder, exploring further and investigating more deeply into every project. Our teams of leading engineers not only meet every challenge, but also stretch your ambitions to create a truly transformative structure. When we connect our engineering professionals around an approach, magic happens. It is something that perhaps clients miss out on with more traditional, silo-styled practices. It is the connections between these specialisms where the magic happens, creating fertile ground for invention and new ideas. We call these approaches ‘Service Offers’ – start exploring them by choosing one from the list below. If your heart and vision lies in creating buildings and environments with this guiding objective, then you have discovered an engineering practice that shares that same sense of responsibility and engagement. You would expect our designs to deliver leaner, greener, cost effective buildings, moreover, the path towards that goal can be extremely exciting, full of invention and ultimately rewarding in the short and long term. Whether your vision is for the greenest office tower in the world, namely The Tower at PNC Plaza, or to create a benchmark in sustainable architectural engineering, as witnessed in our work on the SAMBA Financial Group HQ in Riyadh, or the extraordinary engineering of the Baakenhafen Bridge, you are talking to the right people. Economic, environmental and social parameters are at the core of everything we do, tailored to every client’s unique business and sustainability challenges. The world keeps moving, are your buildings keeping up? 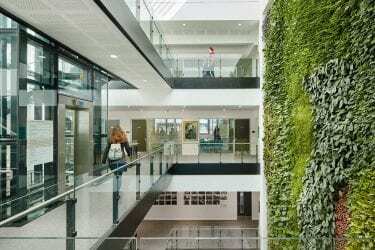 With ever tightening environmental codes you may have a building that has become ‘stranded’ and requires retrofitting such as the David Attenborough building? Whether retrofit or new, we consider the ‘whole life’ of a building. Through rigour, research and analysis we are able to deliver leading edge practices in health, wellbeing and productivity, as exampled by the Genzyme Headquarters in Boston. Our engineering focuses on adaptability and longevity, reducing water and energy consumption, cutting emissions and preventing waste. 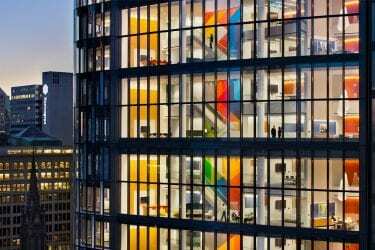 But critically, delivering inspiring spaces, such as those at One Angel Square, Manchester, with the potential to positively impact and change peoples’ lives is where you will find meaning. Would you like to draw on many world leading specialists from across our international practice? They like nothing better than to come together as an integrated team to get to grips with the complex, and sometimes seemingly impossible, challenges the fast moving world of changing environmental codes, building functions and business practice deal out.